With the announcement that my great friends here at Poker News are to cover the WSOP, my mind began spinning again as to who the heck is going to pay for my visit to the big game this year? I am not yet a pro poker player, not yet, although I know it is my destiny as with most of you reading this column. In the meantime I will continue to explore every avenue of getting others to pay for my poker and some of the players I work with, which is what the whole game is about. But of course we have got to give something in return. This week, "her indoors" went off on her travels and I was left alone to play and scheme. With no "High Stakes" to watch and the decrease in the amount of poker on Bravo and Challenge, thanks to the take-over by Virgin Media, I decided to play a little and investigate the entertainment phenomenon of "railbirding". I learnt about railbirding when I played on Poker Night Live. There I sat on a cash game with an audience of at least 12 railbirds waiting to see the goliath that is Catman lose his $50 bankroll. I must say it was fun; there was little verbal and the friendly banter inspired my slap-happy performance. Well, not really, I was on stage and playing for my life. Naturally, in my few appearances, I proved one of the highest hourly rates of any guest or presenter. Was I a mad gambler or was it my inspirational play and good fortune? The internet provides the world's biggest side games and, without doubt, to play high stakes, a small semi in Cricklewood should be your nightly bankroll. On my hopefully short sabbatical from my "Mrs", my aim was to attempt to find a few WSOP qualifiers and try to get a few $100 heads-up games with David Benyamine; after all we were mates. So off I trawled and waited for his arrival. I ended up on the $3/6 Omaha Hi/Lo on Full Tilt, with sit n go's on Paddy Power. At the same time of course I was "railbirding", trawling the net, eating, watching cash poker on TV, blasting Madonna – "Time goes by so slowly" on You Tube, chatting on the mobile phone to the "Mrs", explaining that of course I was not playing poker on her account. Yes my full 100% concentration was on my evening's poker, but playing on the net is so much fun. As Phil Hellmuth had made it very clear to me, a lot of the big side game players in Vegas are simply millionaire businessmen who are all big winners as no one can prove otherwise. Phil is one of the few pro's no one has ever accused of being skint, and his strong views and limited appearances at super high stakes have certainly ensured he will never be skint. But who gives a damm about the money, well that is what you would think, especially if you watch Gus Hansen play Hi/Lo. The man is a god, but the only time I would agree with the railbirds' observations is when it comes to his Omaha play; he is a suicide jockey. But what fun to watch! Gus surely must be loving it too. The man mountain that is David Benyamine has recently become a member of The Full Tilt Posse along with his lovely girlfriend Erica Schoenberg. David "Super Bot" Benyamine has won few major events in comparison to the other pro's, but he is the mother of all cash players. He has already told me of the humungous multi-million dollar swings he has suffered, but not a night went by when he didn't have a half mill or so spread across the games. Clicking through the tables, I saw Gus playing everywhere, Mike Matusow getting up, Phil Ivey and Townsend for a while, but where was the mighty dynamo? 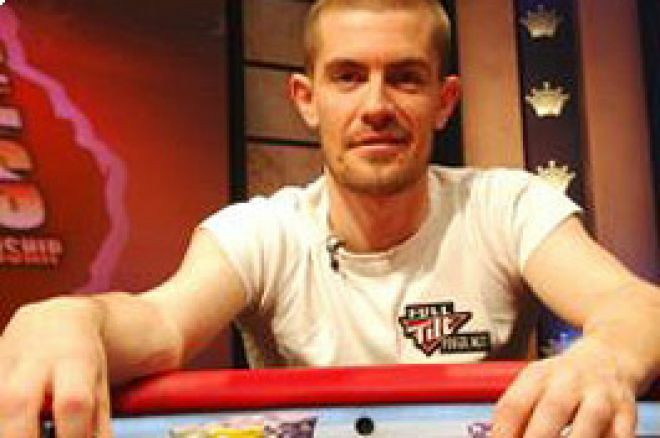 My alter-ego was after high stakes, I clicked to sit down with Gus Hansen; he only had $16k on the table. Oops, my total $1,500 bankroll was already down somewhere else, of course I seriously believed I was sitting down. My illusions of grandeur were instantly quelled when along came the machine himself. David Benyamine had taken his seat. Now, I am thinking, are these "robots", "shivs" or housemen playing as these superstar players or are they all actually so damm rich or insane? Well of course it was the player portrayed on the avatars, but was Bill Gates at this table too? You have got to be a winner to sit down in this exclusive high stakes club, a winner in terms of having the funds to play the biggest cash games in the world, period. Benyamine was always on at least four tables. One night his adversary was "Zigman"; the next along comes a chap called "Luigi 66369". I am led to believe by the forums that this is Patrik Antonius. In Omaha Hi, heads up, $200/$400, "DB" has $40K and Luigi $265; at the same time in $1,000/$2,000 Limit, "DB" has $183k and Luigi $52k. Let's not worry about the other games they are playing. The biggest pot I saw DB win was $215k with quad nines in hold'em. I had to take a quick breather, as I had just managed to win a round of Jackpot Sit'n'Go Hold'em at Paddy's, so my bankroll had just increased another $40. The railbirds, now they are different gravy, oh yes. They fall into two categories, either nice or "Aristocrats". Channel 4 put a programme on the other night - some things just should remain private. "Aristocrats" is the world's most disgusting joke, it is beyond anything imaginable, and Channel 4 put an hour and a half programme on, to educate us. I first saw it performed by South Park. But like this joke, the railbirds will have you in hysterics at Full Tilt. "Gus, you are a ****, a****** **** player, blah blah de blah." as the man's bankroll goes from $16k to $72k in a microsecond. You cannot help but smile at the verbal, the yanks love to give it, the players delight in it – you know it makes sense. As "Zigman" drops another $50k to the roars of "*******, learner, go home", etc, etc. Now how bad do you feel if a comment is breathed near a live game, after you just did your last £50? Tell the truth. This is the world's greatest show. Online and live cash are like "Men are from Mars and Women are from Venus". It's not just the speed of the game, it is the world you immerse yourself in. Tell me the last time you saw three pots over £15k in a live game you were in, or standing by? Time to railbird. My first comment to Gus was "Where exactly can you purchase nuts of steel?" No reply, as was the norm. But this was indeed a serious question. Playing high stakes has a number of pre-requisites to satisfy; unlimited bankroll with not a fear in the world of losing the lot and discipline that is worthy of the true master. Benyamine was said to have conquered the big game, $4,000 - $8,000 at the Bellagio, but that cannot come within a mile of the amounts played on Full Tilt. We are looking at players close to Benyamine anything between 300 to 500 hands per hour, with average pots between $2,000 and $9,000. Working on the lower figure, 5 hands a minute. Tell me if I am wrong, but the money goes in as easy as a knife into butter in online play. The high stakes legends like DB, Ram and Ivey are all enigmatic. In life, calm, softly spoken charmers; online or live play, titanic rulers. Live play, still calm and spiritual, but what the hell is going on when DB is playing 5 hands a minute on tables half filled with those more beautifully insane than Beethoven himself, battling with multi-millionaires and gamblers on rocket fuel. How does Benyamine focus? Is he playing naked with Erica dancing like J-Lo in the background? Does Phil Ivey body-pop to his walkman? Tell me what's happening! I want to taste this caviar; high stakes is the opium of us all. Pull up in your Enzo, open the mansion door to be greeted by twenty maidens belly-dancing you to your 4x90 inch plasma as you prepare for battle. This is it, I am really going to push to include webcam TV poker, I am going to get into DB's suite, wherever he and Erica are, and give them some in-your-face film crew treatment, whilst he is doing the wildest high stakes poker fandango. I love these players; no one can touch the sheer guts of winning high stakes players. Don't ask me who is winning and who is skint, I don't care, they are giving entertainment akin to those who were thrown into the lion dens by the Romans. So, with due diligence, as the "Mrs" had now returned from her travels, I whisked her off to the cinema to see "The Lives Of Others (Das Leben Der Anderen)", some arty-farty stuff about the Stasi secret police chasing a writer before the fall of the Berlin Wall etc. On a lighter note, last year at the WSOP I got a lovely chat and a nice photo with American Beauty star Mena Suvari, yeah baby. Then, bingo, the Orange ads and there she was, our very own Poker Princess playing a Britney Spears type. Sweet dreams to end the week on.